According to Japanese legend, there once was a clumsy little cat that decided to sit under a tree and take a nap. The cat slept quite blissfully until it was abruptly woken up. His tail was on fire! The cat panicked and began running all over town looking for way to douse the flames. Clumsy as he was, he managed to set fire to every building in town! The destruction in the town was so bad that the Emperor declared that all cats must have their tails cut off so that the event could not be repeated. 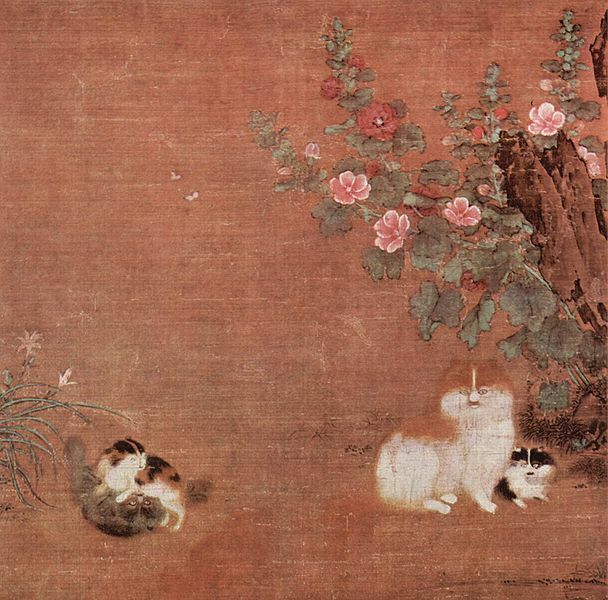 This tale gives us a folklore explanation of the Japanese Bobtail cat’s most prominent feature – the tiny tail. As you might suspect, the legend isn’t true. The Japanese Bobtail cat actually gets it’s little pom-pom tail from a dominant genetic trait according to the Cat Fancier’s Association. All of the tail vertebrae that would be in any other cat’s tail are there, but they are much tinier. The tail is usually curved, kinked, or angled making it look much smaller shorter than it is. Because of the different fusions that happen between vertebrae and the different curves and angles, no two tails are the same. There are no genetically linked problems with the tails of Japanese Bobtails (unlike the Manx). The fur on the tail also happens to be longer than the rest of the fur on the cat, which gives it that pom-pom sort of look. The Japanese Bobtail has a very unique face. The face shape is almost a perfect equilateral triangle with high, defined cheek bones. The eyes are large and more oval shaped than round. There are a variety of eye colors with at least one blue eye (2 different colored eyes is a common trait) are the most highly valued. The Mi-Ke variety are considered to be the most “lucky” of the cats. Blue eyes (called “silver” by Japanese cat fanciers) are most common on Japanese Bobtails that are mostly white. The Japanese Bobtail made its way to Japan through China and Korea up to 1,000 years ago. It is proposed that it could have been Bhuddist monks that brought the cats with them. Old Japanese writings and art mention cats with short tails. Since cats are good hunters of mice, they were used in temples in Japan to protect rice paper scrolls. In the 1600’s Japan had a thriving silk industry that became threatened by rodents who would eat the silk worms and their eggs. As the story goes, the Emperor called upon the cats to help rid them of the vermin that plagued their silk industry. He ordered that all cats being kept in houses be released to roam the streets. The cats saved the day! Even today, the Japanese Bobtail is considered a “street cat” in Japan. Japanese Bobtail cats are highly revered in the Japanese culture. The Japanese icon Maneki Neko (the beckoning cat) is a Japanese bobtail. You can find Maneki Neko statues in many store fronts, temples, and homes in Japan. The statues are used to bring good luck and wealth. A much more recent addition, Hello Kitty is also modeled after a Japanese Bobtail cat. Energetic, loving, happy, playful, and intelligent are all words that describe the personality of Japanese Bobtail cats. They are very people-oriented and the want to interact with their humans as often as possible. Children and other pets will get along great with a Japanese Bobtail cat. These kitties love to play games like fetch, tag, and “soccer.” They are not really lap cats (they prefer to be active), but they will “help” you with anything that you are doing. You may even get a song or two out of these talkative cats! They have a large vocal range for a cat and it is said that they can sing. You can even take the Japanese Bobtail to go! These cats like to travel and do very well in hotel rooms. Thank you! They have tails that look kind of like bunny tails, don’t you think? Thank you. I thought the same thing 🙂 They are very elegant looking cats. Thank you for a good detailed information and sweet stories next to it. What a great post and timed nicely for me- I was watching my friends bob-tailed cat play last week and I was simply fascinated by how intricately it could move it’s tail. I didn’t get a chance to ask my friend about the breed/mix but now I think I know! Thanks! You’re welcome! I’m glad I could help you understand your friend’s cat a little better 🙂 It’s always cool when those little coincidences happen. Sounds like your friend has a really cool cat. Thanks for sharing all this good information. I was not aware! Happy New Year – WOOF WOOF! You are very welcome 🙂 Happy New Year to you as well! I hope yours has been as good as ours has. Good job Robin. I don’t believe Manna either.